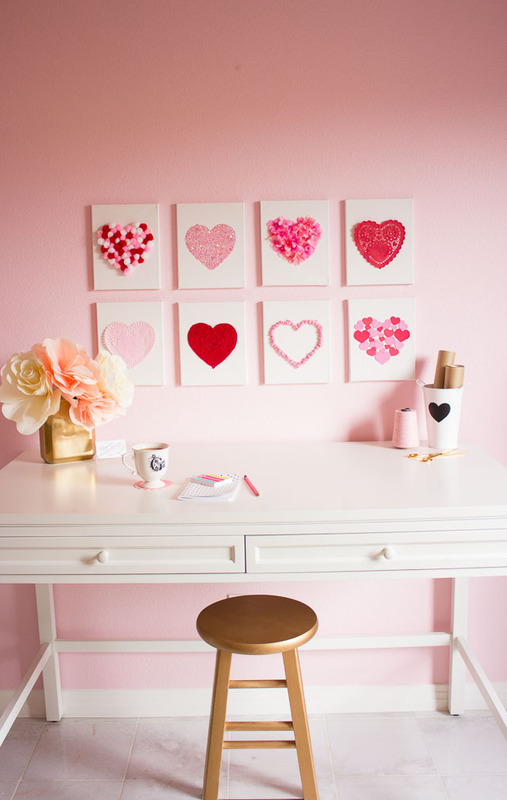 I decided to give my office a little Valentine’s Day makeover, but this DIY heart art turned out so cute, I might have to leave it up all year! What do you think? 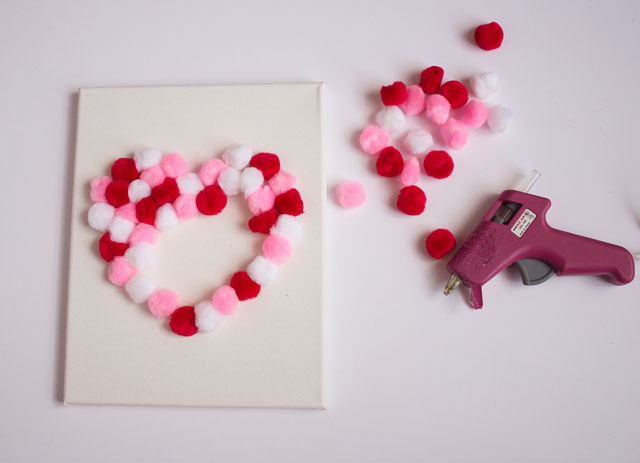 This project is all about using items you already have on hand and putting them into heart form! 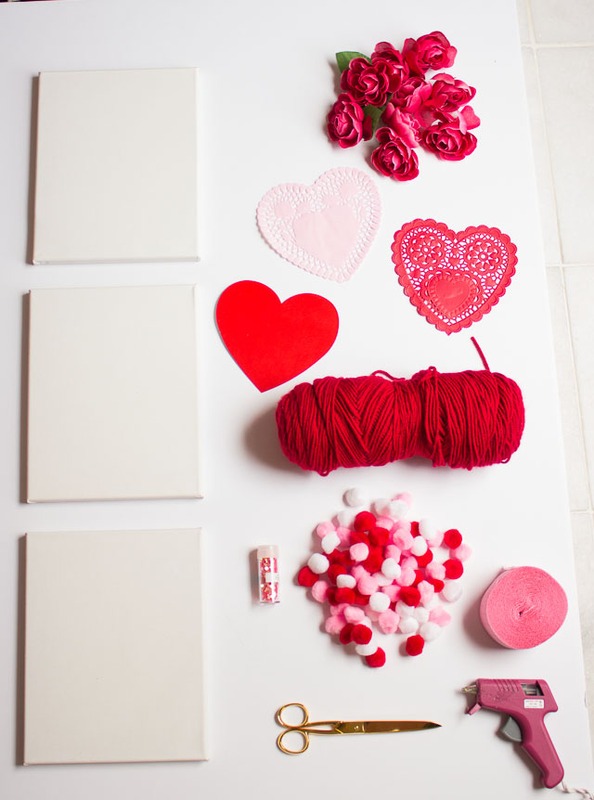 Just dig through your craft supplies and pull out anything that is red or pink. 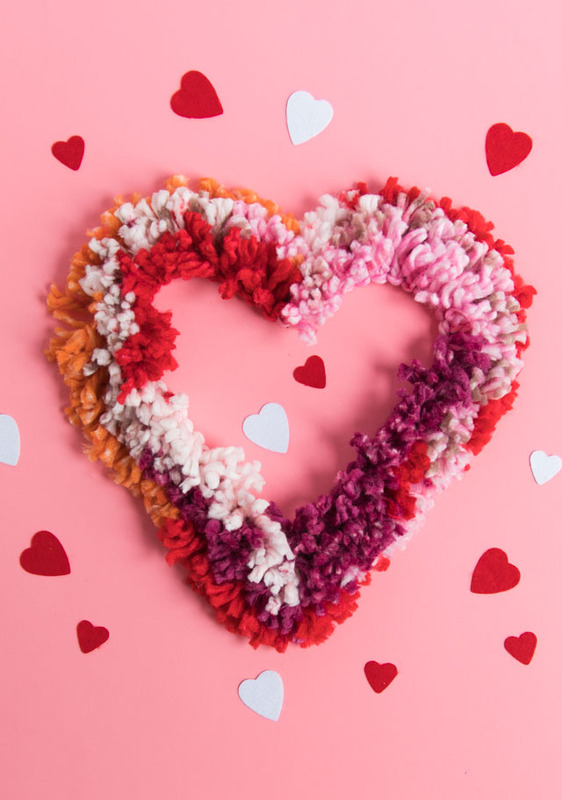 The supplies I used included some of my favorites like pom poms, yarn, and glitter, but you can use whatever you have on hand. 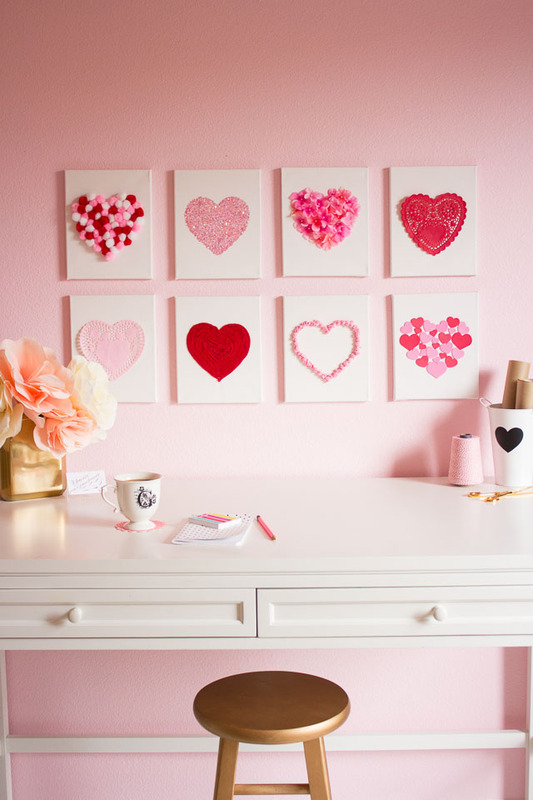 Then you just need a set of small canvases. I found a pack of ten on sale at Michael’s for $10. Canvases are frequently on sale at the craft stores (or you can use their 40-50% off coupon). Here’s some examples of what you can use, but the options are endless! 1. 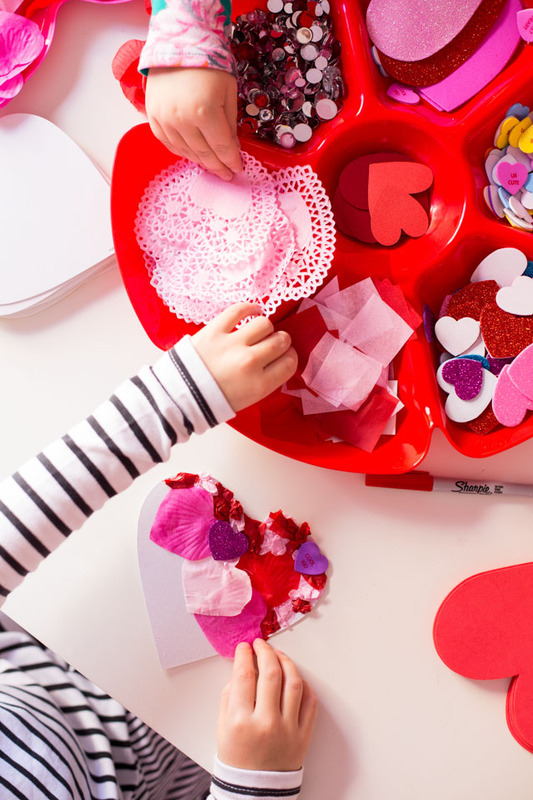 Trace a heart template to ensure all your hearts are the same size. 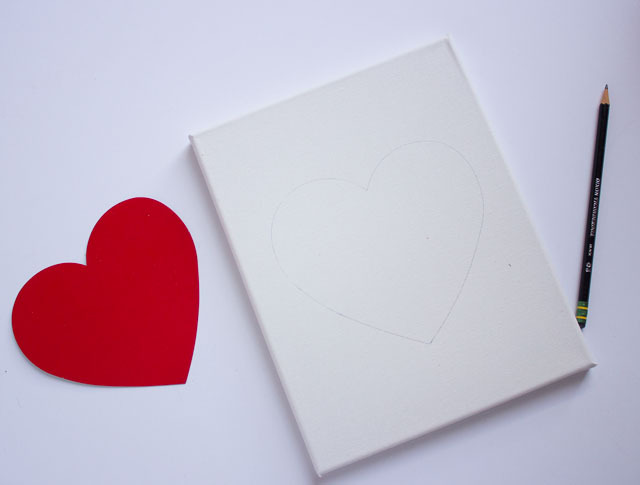 I used a cardboard heart I had, but you can print out a template from the internet. Measure where you want it on the canvas and trace lightly with a pencil. 2. Start filling your outline with any material you want! 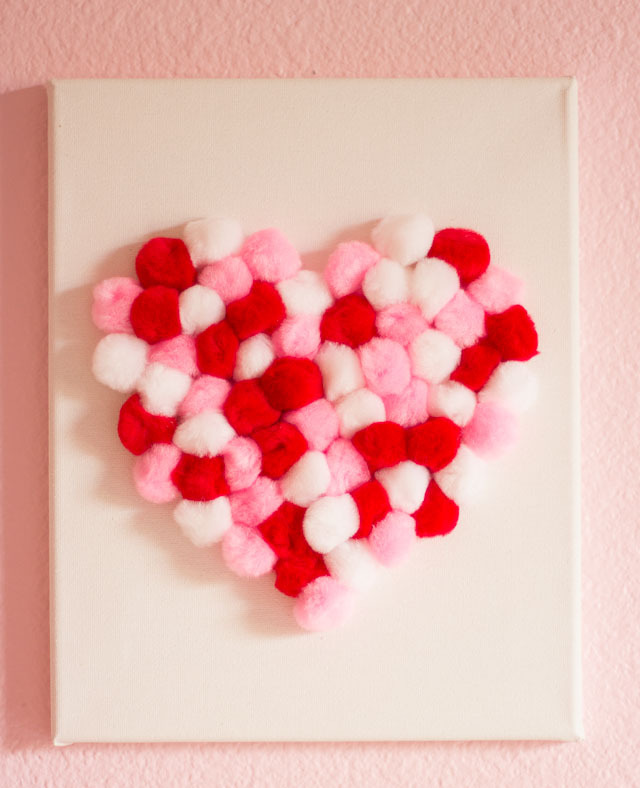 I used a glue gun to affix pom poms to the canvas. I started by working around the outline, and then filling in the heart while randomly scattering the different colors. For the flowers, I used a similar approach as the pom-poms. 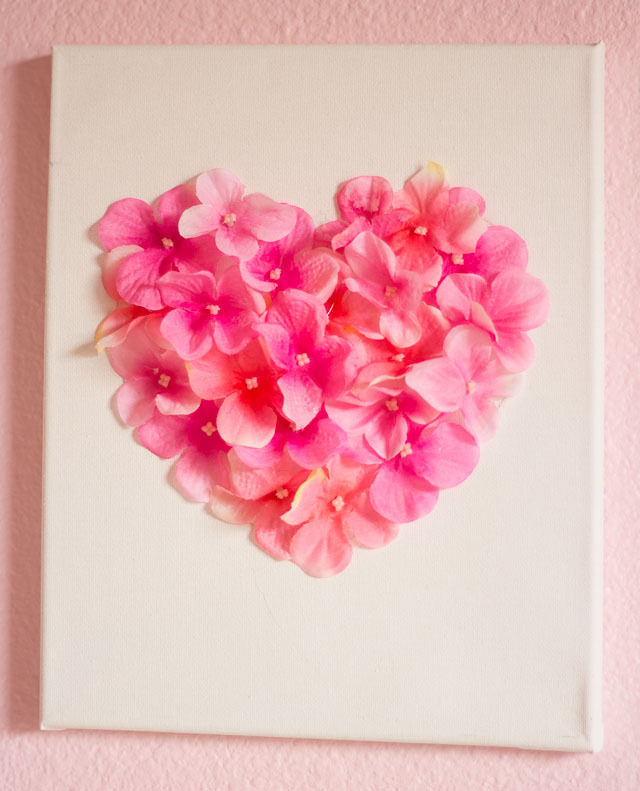 I clipped them off their stem and then hot glued them around the heart, starting with the outside and then working into the middle. 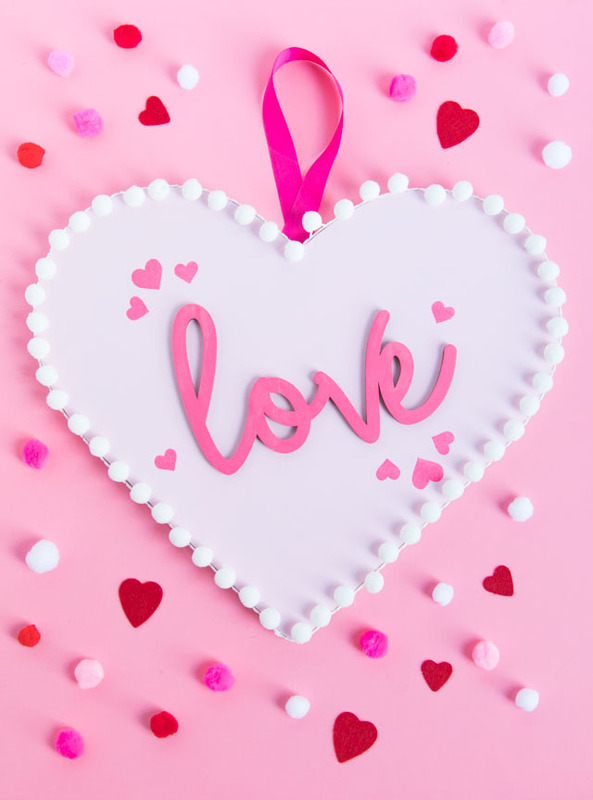 For the tissue paper heart, I cut 2 inch strips of crepe paper and then scrunched into little balls with my fingers. Then I ran a bead of craft glue around the heart outline and stuck them on. You can fill in the whole heart if you want, but your fingers might start hurting from making all the little balls! 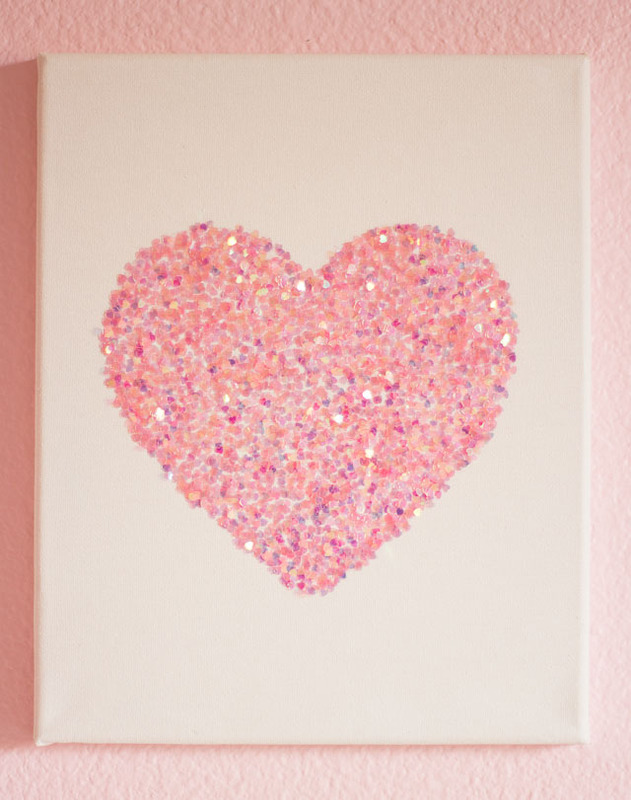 For the glitter heart, I spread an even layer of Mod Podge within the heart outline using a small brush and then sprinkled on the glitter. 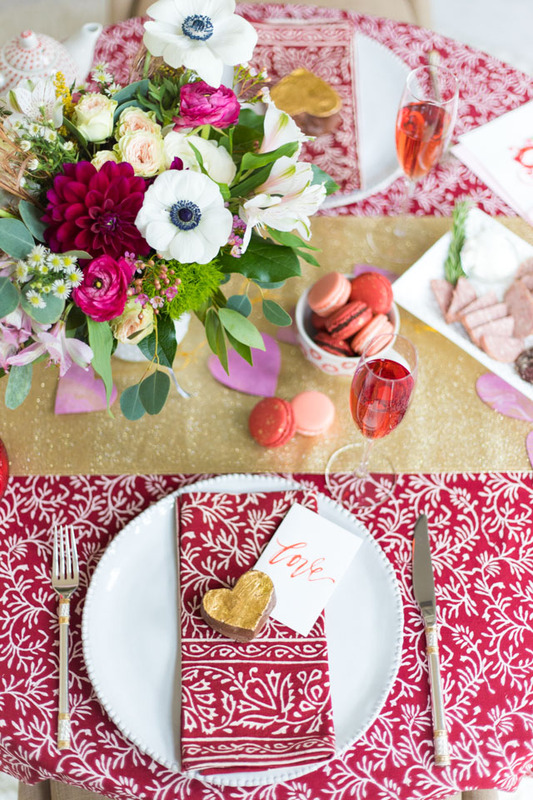 I used Martha Stewart heart glitter for this. The yarn heart took the longest amount of time. 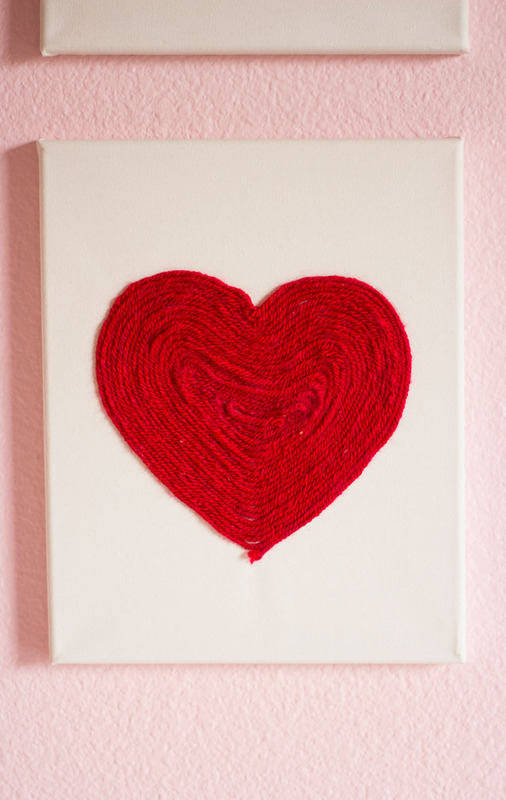 To make it, I ran a bead of Elmer’s glue around the outline of the heart and then pressed the yarn into it. 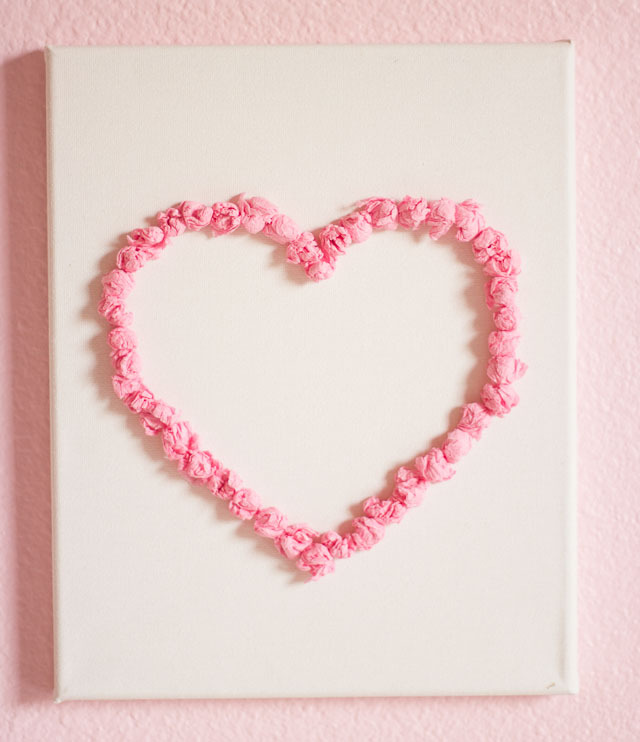 I kept adding more beads of glue and pressed the yarn into it, working towards the middle of the heart. It is a little tricky to keep it all in place, but the results are pretty cool! 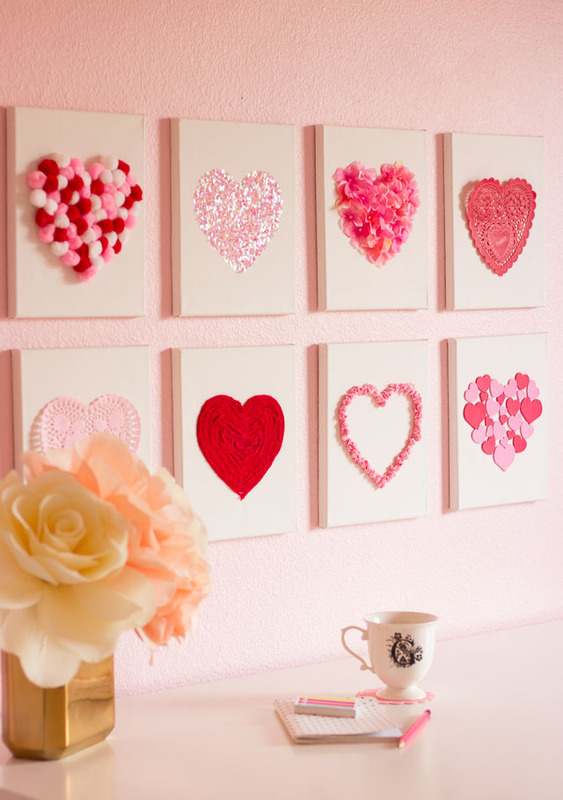 I also used a couple heart doilies (just tape or glue onto the canvas) and I used foam heart stickers to make the heart at the bottom right. Once I had finished making the canvases, I laid out them on the floor and moved them around until I had the order I liked. 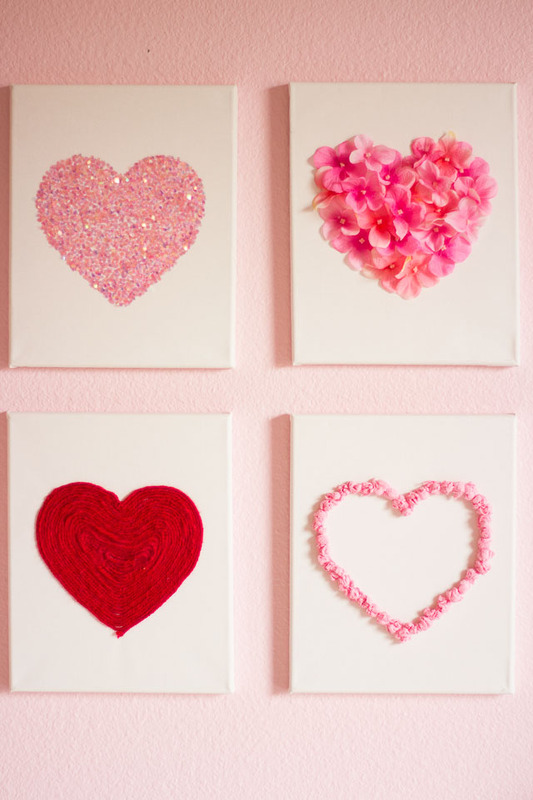 I hung them on the wall using a small nail. 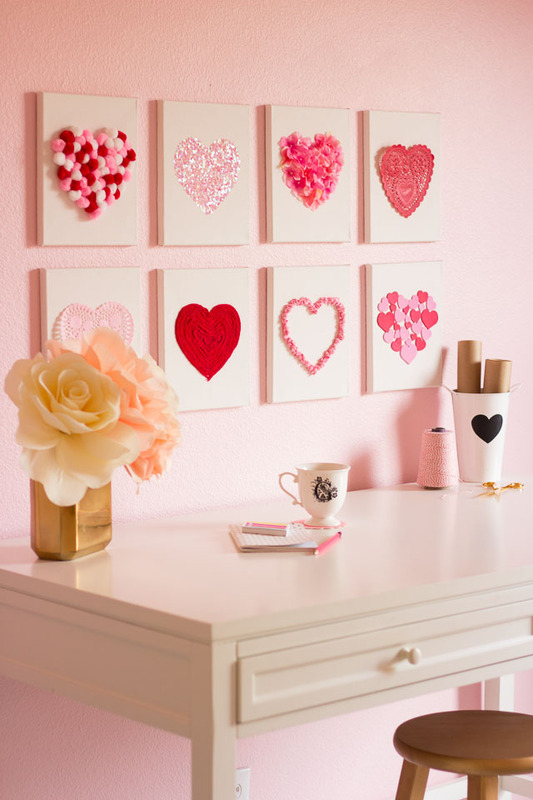 Be careful to measure out their placement so they are evenly spaced and straight!